Female RJ45 pass-thru receptacle to 8 inch shielded pre-terminated CAT5e cable inside. 15/16" - 20 UNEF (Unified Extra Fine Thread) outer threading. 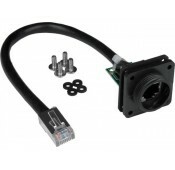 How to use: can be front mounted to a panel with included screws and gaskets. 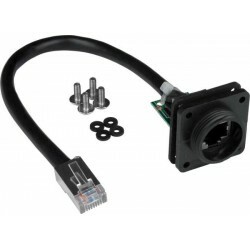 Requires CAT5E-WTP-WU20-xM-SHLD or CAT5E-WTP-WU20RA-xM-SHLD waterproof cables, or RJ45-5EWTP-CB20-LONG cable side gland for complete connection.